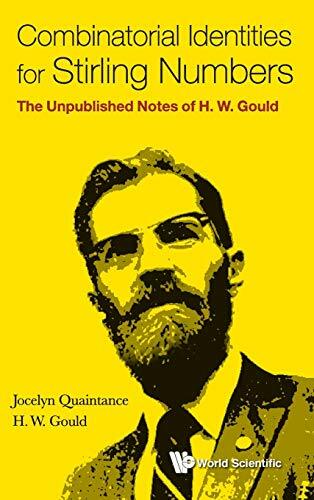 This book is a unique work which provides an in-depth exploration into the mathematical expertise, philosophy, and knowledge of H W Gould. It is written in a style that is accessible to the reader with basic mathematical knowledge, and yet contains material that will be of interest to the specialist in enumerative combinatorics. This book begins with exposition on the combinatorial and algebraic techniques that Professor Gould uses for proving binomial identities. These techniques are then applied to develop formulas which relate Stirling numbers of the second kind to Stirling numbers of the first kind. Professor Gould's techniques also provide connections between both types of Stirling numbers and Bernoulli numbers. Professor Gould believes his research success comes from his intuition on how to discover combinatorial identities.This book will appeal to a wide audience and may be used either as lecture notes for a beginning graduate level combinatorics class, or as a research supplement for the specialist in enumerative combinatorics.